The Ceilidh Allstars specialise in Irish, Scottish and English Ceilidh dances where a ‘caller’ explains simple, group folk dances. 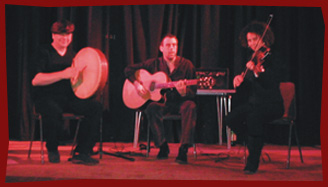 The Ceilidh Allstars is a long established collective of Cambridge and London based internationally renowned musicians. Dedicated to high quality traditional dance music with a party attitude, they place the emphasis on audience enjoyment and participation. Ceilidhs are an ideal way to break the ice at weddings, conferences or functions where people may be meeting for the first time; no previous experience is necessary and all ages can join in the easy dance steps! Equally at home in a barn or a ballroom, from a solo Irish fiddle to full Ceilidh or Cajun band, The Ceilidh Allstars will provide punctual, polite and professional musicians to suit all occasions and budgets. With a Phd in Irish music, fiddler Hazel Fairbairn and seasoned guitarist John Lawson are regularly joined by caller Mary Panton, who has led dances for Princess Ann and the Houses of Parliament amongst others. The Ceilidh Allstars also include an accordion player who tours with Joan Baez and Eliza Carthy, former ‘All Ireland’ accordion and fiddle champions and a bodhran player who has recorded with Ewan McColl and Peggy Seeger. The Ceilidh Allstars are happy to offer free scheduling advice based on decades of experience to help make your event extra special! These are a selection of the easier dances that most people can manage at a social function such as a wedding. Please enquire if you have a favourite not listed here. The band has a repertoire of hundreds of tunes from the British Isles: reels, jigs, hornpipes, slip jigs, polkas, waltzes, marches, ayres and strathspeys. They can also play some North American and European folk tunes for variety. Listed below are a few of the best-known celtic tunes they play, but please get in touch if the tune(s) you are looking for aren’t on this list as they do consider all client requests.